What is the Exhaust Fan Interceptor? The Exhaust Fan Interceptor (EFI) is a rooftop grease containment device for the exhaust fans of restaurants. The EFI is an attachment for the rooftop exhaust fan. As the rooftop exhaust fan operates, hot air and grease travel up from the restaurant and into the fan. The air condenses the fumes and turns into liquid grease and along with rain water, this mix drips out of the fan. This is a standard design for most exhaust fans in North America. The Exhaust Fan Interceptor separates the oil from the water. The oil remains in the EFI and clean water flows freely from the unit. It uses the simple principle that oil floats on water. 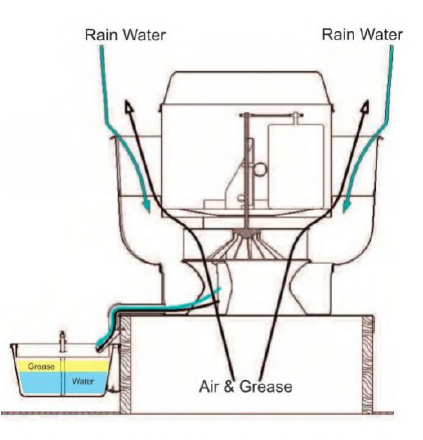 It does not need filters, pads, pillows or expensive retrofitting of the exhaust system to capture grease. It’s the only solution that works!